This is as far as you can get to the ends of the earth. 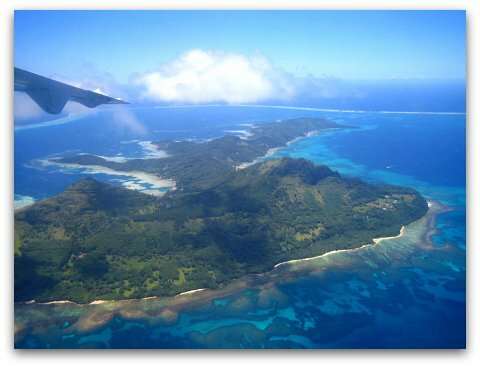 More than 1,600 kilometers southeast of Tahiti, the Gambier group consists of 14 small mountainous islands, the largest and most populated of which is Mangareva. The cradle of Polynesian Catholicism in the nineteenth century, these islands hold more than one hundred stone buildings built from that time, including churches, presbyteries, convents, schools, weaving workshops, bakers' ovens and watch towers. The main village, Rikitea, has the imposing St Michael's cathedral dating from 1848 whose masterpiece is the altar richly decorated in pearls and mother of pearl. The lagoons of Mangareva were formerly worked for their pearl oysters. This work continues today since the biggest and most famous pearl farms are here, being the main resource of these islands. Its lagoons are reputed to be the best source of fine quality pearls. If you want to bike around the island, be aware that some tracks are pretty steep. There are only a few stores. 1000 CFP francs = 8.38 euros. Credit cards not accepted.